Hello lovelies! It's Thursday, which means it's time for me to link up to Natasha and Kim's Old to New in October! Today's inspiration comes from the Sam Edelman Adena Rose Gold Flat. I love these shoes and still covet them, but I'm on a shopping break, so it's a no go for me right now. After seeing Grace's Rose Gold Miniaudiere DIY, I knew what I had to do. I gathered my supplies and followed her perfect instructions. I stuffed the shoes with newspaper so they would kind of hold shape and also so I wouldn't mess up the insides too much. Also, in hindsight, I should have added alot more glitter to my mod podge, since I ended up doing like 8 coats! Here it is after one coat. Let each coat dry thoroughly before applying the next! And here's what they look like now! I thought they were done, until I took the picture and the flash revealed some still visible zebra stripes. Ughhh. Another coat tonight and hopefully that should do it! I cannot wait to wear these with some ankle length trousers! Be sure to visit Natasha and Kim's blogs as well as the other ladies who are linking up their projects too! Also, Old to New in October is sponsored by Anika Burke Eclectic Boutique, so be sure to check them out as well! If you haven't already, don't forget to enter my Shabby Apple Cameo Necklace Giveaway!!!! Fantastic! If only you could find some rose gold studs now, that would be so cool! Someone got a makeover :) Gorgeous - love rose gold! So cute! Love the decoupaging! Love all of your DIY projects. This is great and the shoes are really fabulous. I think you should do an etsy shop from refashioned items. There is a designer for First Coast Fashion Week that does that and I think you would be great at it. Adorable! 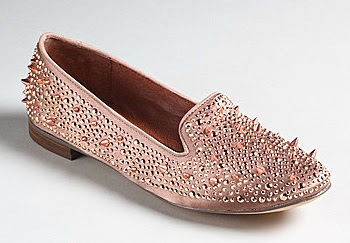 I'm also way more a flats than heels gal, so I'm excited to see you taking the glitter trend to a different level. I'm kicking myself for all the cheap flats I've tossed. Lesson learned. Great DIY, Lia! They turned out beautifully! Love them, they turned out beautifully!! You are seriously so creative...and brave! All that glitter makes me nervous but obviously it was worth it. Looks great! That is so cool! Love all the sparkles :) Like your new blog layout too.